Backless chairs are a bold choice for a theater, I thought as I sat on a stiff ledge at English Theater Berlin, the city’s international performing arts center. Backless chairs say, “You will be so riveted by this play that you won’t even consider leaning back.” Backless chairs also say, “Comfort is not the point of this experience.” As such, the expectations were high for Berlin Diary, which premiered this past October. Berlin Diary was written by Oregon-based playwright Andrea Stolowitz in 2015. Stolowitz, also a recipient of the Oregon Book Award, was a playwright-in-residence at the English Theater Berlin. The piece focuses on the history of many generations of the Cohnreich family. Based on a true story, the author and narrator finds a diary from 1939 written by Stolowitz’s great-grandfather, Dr. Max Cohnreich, who fled Berlin during the Holocaust and settled in New York City. The diary was intended for his unborn grandchildren to find. Through the lens of the recovered diary, Andrea attempts to bridge the fragmented history of her family. In this ambitious play, Stolowitz straddles two distinctly different eras: the 1930’s and modern day. She compiles the narratives of not only a deceased relative and her own observations, but also those of numerous other family members. 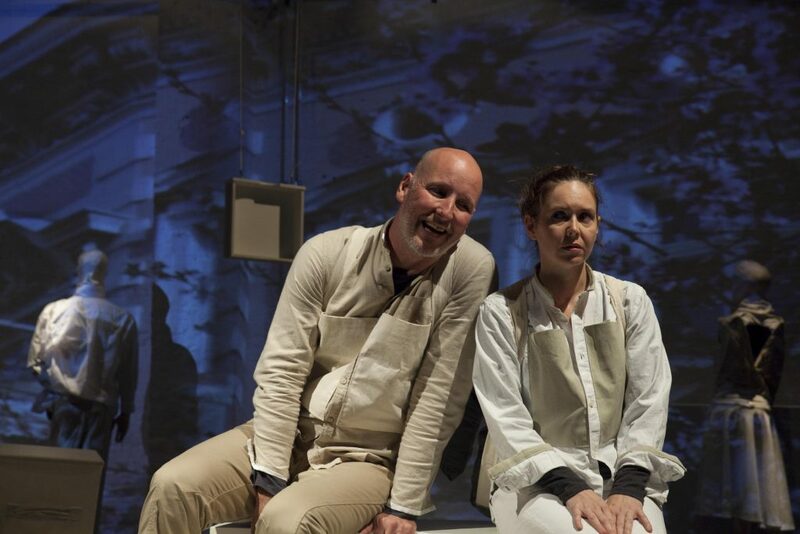 All of the play is performed by just two actors who manipulate many different languages and accents, from German to English in a German accent to English with a thick New York inflection. The two actors would often exchange roles mid-scene. The stage design was similarly minimal. Composed of white furniture covered in white sheets, it felt more like an IKEA stockroom than the grit of World War II era Berlin. This pared-down stage design was unoffensive in its conservatism and gave the play a postmodern feel. However, the humorous and nostalgic tone of the play failed to align with the set-up. This dissonance between the plot itself and the stage design was ultimately distracting. In addition, it was difficult to empathize with the narrator’s determination to upheave her family’s history. As the main character’s motivation became increasingly muddled, the piece itself no longer engaged the audience. At one point a man in the audience fell asleep and rolled out of his (backless) chair onto the floor. Whether this was because of the seating or way the play lulled after the intermission remains unclear. The play was saved by its moments of humor. Though most of the material was of a serious nature, the play had moments of hilarity. For example, one charming scene involved a distant relative from South Africa who, due to a vitamin deficiency, had been asleep for the majority of ten years. The strong writing and characterization in this and other scenes helped maintain the play’s momentum. Despite the hopefulness of the backless chairs, the play was hindered by its minimalist stage set-up and meandering main character. There was something dissatisfying about the performance, humorous moments aside. It failed to take risks: its stage design was reserved, as was its casting and the motivation of the main character. Berlin Diary was ultimately less of a diary with all its intimacies and more of an entertaining way to scratch the surface of Berlin’s complex history. Redirect here to find out what is coming up at English Theater Berlin, or keep abreast of the latest “Kulturbahn”, featuring a careful selection of upcoming Berlin events.